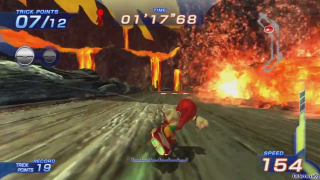 Magma Rift is the fifth racecourse in Sonic Free Riders. This stage is themed largely like a volcano, having lava, caves and large volcanic rocks that follow the perimeter on most of the course. There are many secret passages that a player can take to get ahead of the rest of the racers. The main gimmick of this track is that at one point, steam will obstruct the player's vision, forcing them to rub off the steam.